The last ten days have been some of the most stressful that I can remember in quite some time. For a variety of reasons (which I won't unload on you) Chanda and I have felt weighed down and to be quite honest we could see the effects all the stress was having on our family. We were all frustrated, short tempered and just plain grumpy. But today we decided we were going to have a good day! After the older kids got out of school Chanda and I announced that we were going to hit the trails. The kids suggested a park called Hudson Springs about 20 miles from our home with a pretty challenging but rather short running trail that also sported a kids play area made up of at least four playground sets, a rock wall, a giant slide and a dozen or so swings. Chanda and I agreed to take turns hanging with the kids while the other ran the trail. After each lap the person running would check in at the playground and if everyone was doing well they could do another lap. As we drove to the trail you could feel the tension in the van already starting to dissipate. Everyone was looking forward to enjoying some time outside...Until we arrived. I could feel the tension in the van begin to rise as we surveyed the seen. I now know why they call it Hudson SPRINGS! It was practically underwater! Here in Northeast Ohio we have had more rain in the last 30 days then they have had in Seattle and the whole park was a swamp. "Oh no!" cried my oldest as she looked out the windshield toward the playground, "How are we going to get over there?" I took a deep breath. "We are going to have a good day." I thought to myself. "We'll just go that way." I said allowed, pointing to a high place that looked like it might be dryer. "It won't be so bad." I was wrong. There was no dry way to get to the playground. Every square inch of that field was swampland. By the time we made it to the first jungle gym the we were all a mess! My four year old son's fairly new running shoes were encased in mud, the girls had somehow managed to get mud up to their knees, our youngest walker (a year and a half old) had already sat in the mud three or four times and both Chanda and I had mud all over our running shoes. We all just stood there looking at each other, surveying the damage. "What do you want to do?" Chanda asked. I thought about it for a minute. We were all there. Already muddy. There was no way to get back to the van without getting even messier. She just looked at me. Then without a word she strapped on her watch, grabbed her water bottle and headed into the woods. When she got back the kids were covered in mud from head to toe. They had it in their hair, on their faces and all over their clothes. The trails weren't quite as wet but looking at Chanda's shoes I knew that she had seen mud out there too. Chanda ran her laps and then I ran too and the while the kids got muddier and muddier. We were having a ball! As we drove home, mud encrusted children dozing in their seats, Chanda sighed, "I think that was just what we needed." It was. The circumstances that lead to our feeling so stressed are still there but we all walked away from that park with our heads clear. Being outside, playing, running, getting muddy...it was therapeutic. It allowed us to refocus on what was really important, to remember who we are and who is really in control. What we needed was a little mud therapy. And as we drove away I was reminded of a Bible passage at the end of Mathew 6, "But seek first his kingdom and his righteousness and all of these things will be given to you as well. And do not worry about tomorrow, for tomorrow will worry about itself. Each day has enough trouble of it's own." Cut the tops off of the peppers and clean them out. In a bowl, combine the rice, black beans (rinsed), frozen corn, taco sauce or salsa, organic taco seasoning, garlic, chilli powder & cumin (to taste). In a blender, combine water, Nutritional yeast, cornstarch, flour and salt. Blend until smooth. Pour into a sauce pan and stir over medium heat until sauce begins to bubble. Allow to bubble for 30 seconds. Pour sauce into bowl with rice and other ingredients. Stir well. Place the peppers in a 9"x11" pan. Bake for 30-45 minutes or until the peppers are soft. Is it true that some lessons are best learned the hard way? I don't think so. I often tell the kids in my church to listen to their parents because lessons learned the hard way aren't learned better they just hurt more. 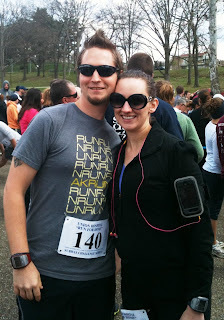 On Sunday Chanda and I both ran our first half marathon. (Yes, Chanda has run a full marathon but never the half. I guess she kinda skipped that step!) Going into this race Chanda and I had very different goals. Chanda wanted to celebrate the end of being a "tax widow", have fun and, most importantly, finish the race pain free, indicating that she is ready to begin marathon training. Me? I wanted to see how fast I could do it! And having never run a half before, I set what I considered a pretty ambitious time goal. Now, I feel that we are both pretty well read runners but as we were pressing toward the finish line we both realized that booksmart doesn't get you to your goal and being "newbie" half marathoners we had some lessons to learn. Lessons that you don't learn on the treadmill. Lessons that you can't know until you've raced. These are the things we learned on the street! Lesson #1 Training is Training. I'm sure you've read about the importance of training in the morning. It probably went something like this, "Recent studies have shown that the human body naturally performs at its best in the afternoon but you can train your body to perform well anytime simply by doing the bulk of your training that time of day. If your race will be run in the morning you can train your body to perform well in the morning by getting up earlier and training before school, work, etc." It's a pretty widespread and highly accepted theory. It's in just about every running magazine and running blog out there. You have to train when you race! I've even seen timelines showing how you should go to bed at 9:30 and get up at 5am to train! Here's my problem with that theory. WHO RACES AT 5:30AM? I mean...SERIOUSLY?!? Now, I know there are a few races out there that start in the wee hours of the morning but around here most races start between the hours of 7 and 9am. That poses a problem for just about anyone who has school, a family or a job. Let alone all three! Using that theory we should all be logging miles at the same time as we are eating breakfast, getting our kids dressed, getting ourselves ready for work, packing lunches, making sure the kids brushed their teeth & hair, loading them into the car, rushing them off to school, carpooling and drinking our first cup of coffee at work. That sounds feasible! What I realized is simple. Training is training. It doesn't matter if you do it at 5am or 11pm as long as you do it. On race day you will reap the rewards of your hard work regardless of what time your alarm clock goes off every morning. This one is pretty easily overlooked but extremely important! Long runs leading up to race day are the time to experiment with proper fueling. Race day...not so much. While training Chanda and I both fueled the same for long runs. Between 45 and 60 minutes into our run, regardless of distance we would eat most of (or in my case all of) a cliff bar and then switch from water to a sports drink. The day before our race while I was freaking out about how I was going to carry a cliff bar in my pocketless running shorts Chanda was picking up some Gu packs from a vendor at the expo. And on race day when I was cutting my cliff bar into long skinny pieces and shoving them into sandwich baggies so they would fit into the tiny pocket on my water bottle, Chanda was simply slipping those Gu packs into the pocket on her water bottle. She seemed so smart, so cool. She had it all figured out. But at mile nine when I was still plugging along Chanda was feeling light headed and dizzy. "I should have fueled better" she said after the race. Don't make that mistake. Figure out what works for you and stick with it. Practice fueling. It is a vital part of a successful race. Know your course. If it's a fairly local race get a copy of the course map and go out and drive it. If you come to a big hill. Park your car and walk it. Get an idea of how it feels under your feet. Once you've done that you'll be able to modify your workouts. You'll know if your doing enough hill training and you'll be able to approach the race with added confidence of knowing that you are well prepared and that there will be no surprises on that course. As I mentioned earlier Chanda and I had two VERY different goals. Chanda, who ran a marathon in the fall with an IT band injury just wanted to have fun and finish pain free. For her it was a celebration of tax season ending and running season beginning. (for those of you who don't know us I manage a tax prep service during the winter months). Her plan was flexible. I on the other hand had one goal. To finish in under 2 hours. That is what I trained for. That was the plan and I was sticking to it. But there was one very big factor that I had not considered. The wind. The National weather service recorded a steady wind of 25mph with gusts reaching 39mph. Unfortunately, unlike at today's Boston Marathon that wind was NEVER at our backs. About 40% of the time it was a crosswind and the remaining 60% a headwind. Do you know what it's like to run into a 40mph headwind? And when one of those "gusts" hit you from the side...well, lets just say that one sent Chanda careening into the runner beside her. How a loop course had us running into a headwind both ways is still something I cannot figure out! But needless to say running that race required considerably more energy than I had expected. At the eleven mile mark I was out of steam. Another runner eased up beside me. "How are we doing on time?" he asked. "1:45.30...I guess we're not gonna come in under two hours." "I was thinking the same thing" he replied. I started to walk. At mile 10 I had found myself gasping for air and still running a full minute per mile slower than I needed to be going. I had failed. I considered walking it in... But that guy was still plugging along. He was going slow but he was still running. "10 seconds" I though to myself. "Then you have to start running again" I decided to make a new goal. 2:04 (Ironically the same goal Ryan Hall had for today's Boston FULL Marathon) and I started running again. Chanda's goals were flexible and at no point in the race did she feel defeated. I had one goal and the moment I realized I had failed to reach it I was done. Set multiple or flexible goals. If you have a time goal give yourself a backup goal. One that you know you can achieve. That way if something goes wrong (like having to race in a tornado!) you can readjust, refocus and still give it your all. It turns out there are two VERY different kinds of spectators at a race. Spectatheletes and gawkers. Spectatheletes are awesome! They are the ones cheering from the side of the road. The people who lie to you and tell you that you look great, your doing well and that your almost there. They yell your name if it's on your bib or shirt and they give you that extra umph to keep pushing yourself past the discomfort and exhaustion. Gawkers are very different. They sit on the side of the road and...well...gawk. They offer no kind words, encouragement or help of any nature. Instead, their eyes pierce you like a laser beam as you run by sucking energy from your muscles and increasing your fatigue. Yesterday was mostly gawkers. I recommend asking around and seeing if you know anyone else who has run that race before. Ask about the race environment and the crowd. To be honest, I'll take a quiet trail with no spectators over crowded streets filled with gawkers any day! I don't want you to misinterpret this post for something it is not. I'm not whining or complaining about yesterdays race. We had a great time, both feel that we ran great races and are already considering running it again next year. What I am hoping is that you are able to learn from a few of our hard knocks. Because, like I said earlier, lessons learned the hard way aren't learned better they just hurt more. As a kid, I loved Fridays. When the bell rang signaling the end of the school day, I felt the glorious freedom of the weekend stretching out before me. Mom would make something fun for dinner or maybe even bring home take out. My favorite shows would be on tv and my brother and I would be allowed to stay up late enough to watch them. Now I'm the mom, and I want to give my kids that same "break" at the end of their school week. All of our kids are under the age of 7, so only two of them are school aged (one in kindergarten and one in pre-k). It isn't always easy to be the oldest of 5 kids when you're only 6 and 4, so this past Friday we wanted to reward our two oldest with a special family game night just for them. Instead of making a regular dinner, I decided that we'd just eat a smorgasbord of finger foods and appetizers around the table while we played some of our favorite games. Like any other family, the temptation is to break out the chips and dip and bake up some pizza rolls and fry some mozzarella sticks... I mean, come on, it is Friday after all. Instead, we decided to tackle the challenge of making a completely plant based snack-fest. The kids were big helpers in the kitchen and had a blast helping with all the veggies. They tore Kale for chips, shook dressing for salad, tossed chickpeas in spices, and got to add ingredients to the Vitamix for vegan cookie dough. The first thing we had to do was to set out all the ingredients. Kale, radishes, limes, asparagus, raisins, nuts, garbanzo beans and more! 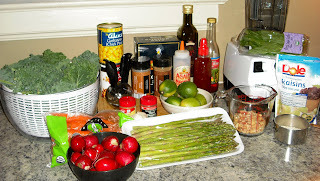 This is the makings of a healthy finger food feast!! One of Lilli and Noah's favorite part of the night was helping in the kitchen! Look at all those delicious colors!! The Final Results? Cucumbers, oven roasted garbonzo beans, kale chips, cooked veggie salad and vegan oatmeal raisin cookie dough. Altogether a fun and delicious game night!